Ishmael Osamor, the now former Haringey Labour councillor who resigned last night following increasing media coverage of his conviction for possession of Class A drugs, declared “nothing out of the ordinary” during his interview for becoming a potential Labour candidate, according to a fellow Labour member who sat on the interview panel. The LCF panel interview is believed to have been conducted on 17 September 2017, just nine days after Osamor’s arrest on 8 September for trying to enter the Bestival music festival in Dorset carrying quantities of cocaine, ecstasy and the Class B substances cannabis and ketamine. Labour’s rules require members hoping to become councillors to declare anything in their political or personal histories that might damage the party’s reputation. Osamor was convicted last week on three charges of possession of illegal drugs with intent to supply and a fourth of possession, having entered a guilty plea. 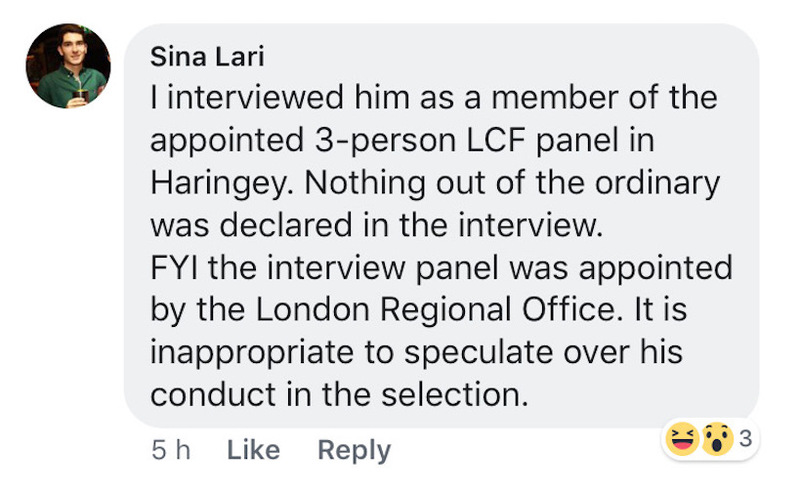 Lari’s Facebook intervention has come as attention has shifted to if and when Osamor disclosed his Bestival arrest to any Labour members involved in the LCF process for ensuring the suitability of potential council candidates. Islington Labour councillor Claudia Webbe, a strong supporter of Jeremy Corbyn who is also a member of Labour’s governing National Executive Committee, played a significant role in the Haringey LCF interview process. She is understood to have closely questioned the then council leader Claire Kober before she was confirmed as a potential candidate. Kober was later re-selected as a candidate, but stood down before May’s borough elections after many sitting councillors had been deselected or chosen to stand down, ensuring that the composition of the new Labour Group would be far more supportive of Corbyn’s leaderhip. On London has contacted Webbe to ask if she took part in the interview of Osamor and whether she recalls him mentioning his drug-related arrest to her. Osamor resigned at a meeting of the Haringey Labour Group last night. 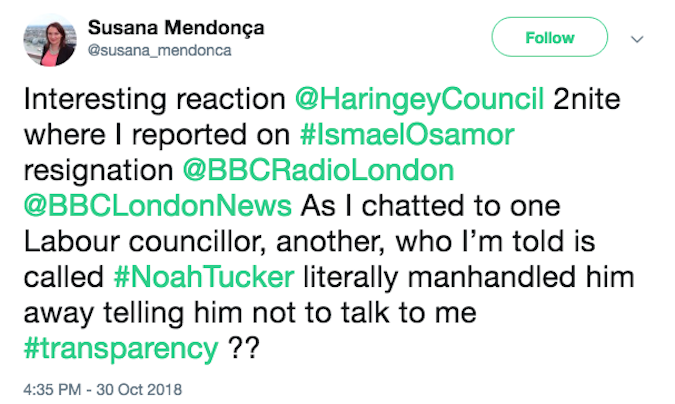 BBC political correspondent Susana Mendonça reported that after the meeting Councillor Noah Tucker, the council’s cabinet member for corporate services and insourcing, “literally manhandled” another Labour councillor, Eldridge Culverwell, away from her as they spoke, telling him not to talk to her. Tucker, who used to run a Far Left website called 21st Century Socialism (now removed from the web), is a former employee of Hackney Council who was sacked in 2001. He became a councillor at a by election in 2015 and, like Osamor, is a strong supporter of Jeremy Corbyn. Haringey’s opposition Liberal Democrats have criticised Labour’s handling of the Osamor affair, saying he should have had the group whip removed and been told to resign immediately, rather than being given four days to reflect on his position. “Labour’s delaying must look to a lot of residents like they were trying to keep Mr Osamor in their council group – or avoid a by-election – and only abandoned that plan when the media attention grew to be too much,” said Lib Dem Group leader Liz Morris.